Indeed, Christmas comes but once a year – as does our holiday gift guide. And that’s a pity! At least our guide keeps getting bigger and bigger! This year, iSlaytheDragon has five writers, all with unique tastes and experiences. That means we’ve all got different kinds of recommendations. Just for you! This year, we’ve decided to bring the holiday goodness all week long! So between our dragon-slaying quintet, you should be able to check off everyone on your list! Well, okay, so we can’t guarantee that you’ll love our choices, but these are our top picks and why we think they’d make great gifts. We do guarantee the quality; so if these games line up with your tastes (or, really, the tastes of the person you’re buying a gift for), we think these will be a hit. Just one piece of advice: if you know some one really doesn’t like board games, respect that! Don’t buy him/her a gift thinking that they just haven’t played the right one, and hoping to convert them. Remember – a gift is always about what they want, not what you would like them to have! On the second day of gift week, your true gaming love gives to you: Social Games. Like our light games yesterday, these titles are quick and simple. You might break them out for similar occasions, though maybe not always geared towards newbies. It might be a pure party game. It could be one of deduction and intrigue. Just maybe it has a touch of depth or subtle strategy. In any case, these are game that will enhance any social gathering – without getting in its way. So, yeah, perfect for entertaining those holiday guests! Happy holiday shopping and gaming! I come to you with 2 Social recommendations, because each one has a caveat. First of all, Cash & Guns is just the most ridiculous social game possibly ever. The game pretty much comes down to pointing fake guns at your friends. Once everyone has chosen a target, anyone who wants to drop out of the round to avoid getting shot can do so. Of course, while you may have 3 guns trained on you, it’s entirely possible that none of them are actually LOADED, so after the dropouts everyone reveals whether or not their gun has a bullet. The survivors who stayed in the game get to split the cash on the table between them. Repeat for 8 rounds. The game is stupidly simple, but it relies entirely on the social element of the game. You must bluff your opponents into dropping out, convince everyone to aim at one guy because he’s DEFINITELY in the lead, and try to avoid becoming a target yourself. It’s silly, and as long as you don’t take yourself seriously, it’s a boatload of fun. The caveat? You can’t get away from the fact that you’re pointing fake guns at each other. Despite the accessible rules and gameplay, I know many parents would (and probably should) be pretty uncomfortable giving their kids a gun to point directly at other kids faces. As such, this game is best fit for teenagers and adults who won’t get offended. 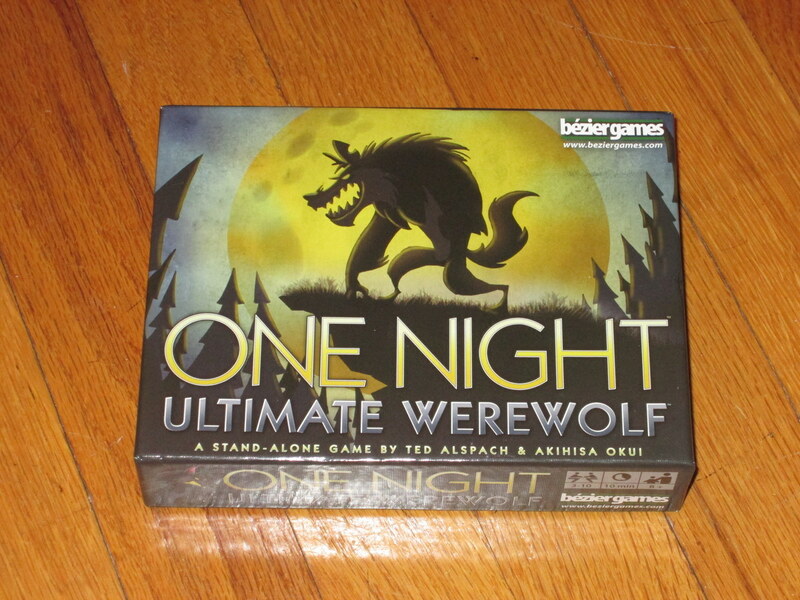 My alternative to this game is One Night Ultimate Werewolf, which of course comes with a disclaimer of its own: much like it’s grandfather game Werewolf and its cousin The Resistance (an iSlaytheDragon favorite that has been recommended many times in past gift guides), ONUW is chock-full of through-your-teeth lying. ONUW is Werewolf, but you don’t play until you’ve eliminated all of one team. You get 1 night and one day. Villagers need to kill at least one Werewolf (or kill no-one if there is no werewolf in play), and the werewolves just need to avoid getting killed for 1 night. The game is on a 10-minute timer and plays quickly, furiously, and hilariously. Each player is assigned a random Role at the start of the game, and 3 cards are placed in the middle – meaning you never know what roles are actually in play. The roles make the game – they add just enough information so the players have a chance of figuring things out. There’s yet another catch – many roles switch other players’ roles around, and the only role that matters is what you end up with – which means you have to figure out if you’re a werewolf after all. What I like about this game – aside from the short gametime that allows multiple rounds in a single session – is that everybody gets to lie. I can pretend I’m the Troublemaker even if I’m just a normal villager, to try and convince someone that I switched their card with someone else, even though I didn’t. Why? If they think i’m truthful and I DID switch their card away, they might tell me they started out as a werewolf so the switcheree is now our target. Of course, I was lying and now I know exactly where to find a werewolf – but only if I convinced him I was telling the truth the first time. Players go back and forth about what they really are and who they really are and it’s silly, zany fun. But there is lying. Who not to buy it for: People who refuse to lie even for a game, people who prefer trivia and only trivia in their social gaming scene. I’ll forgo the party game recommendation in this spot, because my family is stuck on the same few; and you probably don’t need to hear about Apples to Apples and Taboo. Instead, Black Fleet is a nice, casual game that’s perfect for the “not-so-serious” gathering. It has a couple more moving parts than the average gateway game, plus there is some interaction. But it’s light-hearted and in terribly good fun. Each player commands a merchant ship, pirate ship, and naval ship. Navigation cards dictate how your ships move each turn and Fortune cards give you rules-breaking abilities. His Majesty’s ships are trying to catch the pirates, the pirates are trying to catch the merchantmen, and the merchants just want to deliver goods around the nondescript sea, which is vaguely reminiscent of the Caribbean. You earn doubloons for delivering cargo, stealing, burying treasure, and sinking ships – which you need to purchase four different upgrades for your “fleet,” and then finally ransom the governor’s daughter to win. The artwork is fantastic and the components are off the charts. It’s involved enough to engage everyone at the table, but light enough that it won’t dampen the social atmosphere. I had a surreal moment at Origins this year that should convey the kind of game that Concept is. I’d been demoing Splendor for a couple days and after teaching the rules to a group I stepped back and watched for a moment. They were enthralled with studying the cards and figuring out the best gems to grab. The game proceeded in near silence, but the good kind of silence where the players are enjoying the puzzle within the game. In that moment of silence a sudden cheer came from the table right next to the group I was observing. I looked over to see everyone on their feet with their hands up in the air. They were celebrating a shared victory and their success was infectious. The game they were playing was Concept. These two tables were literally side by side with hardly enough room for someone to pass between them. The quite and contemplative Splendor alongside the loud and boisterous Concept. Both excellent games but ones that brought out different sides of the strangers that were enjoying them. I’d tag Concept as the party game for people that don’t want to feel stupid. Instead of giving clues through charades or by navigating a verbal minefield you get to flex your creative muscles in a unique way. It rewards communication but doesn’t put anyone at an advantage because they are a better actor or artist. It’s a sandbox game where you aren’t restricted by a system of limitations. The more creative you are, the more you push the boundaries of the game, the better you’ll do. And the icing on the Concept cake? The rules suggest that you don’t even keep score. Play together, have one player give clues and everyone else guess. Enjoy playing rather than competing. It’s a party game that’s guaranteed not to end in bitter rivalry or start a family feud! Who to buy it for: Party game adverse creative types. Party game loving creative types. Families that want to enjoy an activity that feels like a game. Who not to buy it for: Those who can’t think outside the box or have a burning desire for competition. Telestrations can only be described as a combination of the game of telephone and Pictionary. Players must draw (within a time limit) how best to represent a certain word and then pass it to the next player, who then tries to guess what the word was. They then write this down and passes it to the next person to try and draw. This continues until the pad reaches its original owner at which point the correct word is revealed and you see how far away from it you got! It is fun and light and can be explained quickly to a wide variety of people. It can also be as clean or as rude as your group dictates. Who to buy it for: Families, groups looking for a quick and fun game that will leave you laughing. Who not to buy it for: People who don’t like to draw and guess, or people who don’t like being timed. Gamers who aren’t fans of party games. Word on the Street can be played either individually or in teams by up to eight players. Players are given a card with a category on it and then are given 30 seconds to come up with a word from that category. If they do, they get to move all the letters in the word toward their side of the “street.” The first player/team to get 8 letters all the way over on their side of the street wins the game. Unlike most word games, this one isn’t simply about having a big vocabulary of obscure, random words. Instead, you have to think of a word that can move the letters you need to move in order to win and that word might be something common like “roommate.” Your opponents can mess with you by making words that bring your hard fought letters back toward the middle of the street and over to their side. There’s a little strategy involved here, but above all it’s a fun, fast tug of war over letters. Who to buy it for: Word nerds, people who want a smart and clean party game. Who not to buy it for: People who hate word games and/or timed games.